Shortly after the close of the Civil War, six men were called to police a western outpost. Law enforcement would be done chiefly on foot and occasionally by horseback. No uniforms to wear, no equipment to sign out, just badges pinned to shirts, and six guns to the side. Horsedrawn wagons moved through dirt streets, dimly lit by gaslamps inside the many bars and not so plentiful businesses. This was a frontier town full of promise, preparing for prosperity and realizing order was a necessity. William C. Warren and five deputies were tapped for this duty. The challenges facing L.A.’s first paid police department, were not unlike today’s. Alcohol and firearms posed great threats. Indeed, Warren himself was a victim of gun violence. 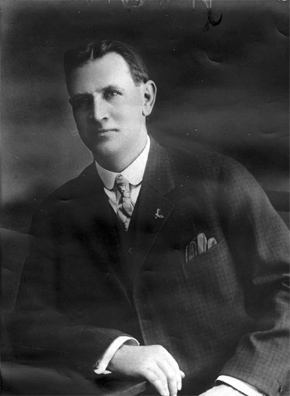 Shot and killed by Joseph Dye, one of his own deputies, Warren was the first member of the LAPD killed in the line of duty. But this was not a time of great record keeping, and certainly not a time when such tragedies were officially recognized. This came years later, in fact that time was 1907, a full century ago. Clyde A. May and his partner, J.M. Hoover of the University station were on bicycles searching for a suspect involved in a late night attempt at robbery. When the officers encountered William Ross, at Adams and San Pedro, Ross opened fire on May. Patrolman Hoover returned fire, killing Ross. May was taken to the Clara Barton hospital where he recovered and was sent home, bullet still lodged in his chest. Twenty-five days later, on February 28, 1907, May died during surgery to remove the bullet fired by Ross. May was officially recognized as the first LAPD officer killed in the line of duty. In the century since the murder of Officer May, nearly two hundred other sacrifices have been recognized. It is a staggering total reflective of the hazards, both new and old, of the law enforcement profession. Alcohol and firearms remain major factors in these losses, but so too do aircraft, automobiles, motorcycles, gangs and drugs. Death, it seems, keeps pace with social development, social ills and technology. It is through technology, consequently, that information concerning Officer May became readily accessible. The same is true with Frank Coe. For as much as we know that C.A. May was the first officially recorded death, we know not why Frank Coe was not the twenty-fourth. Frank Llewelyn Coe, a native of Plymouth, Iowa, wore one of the most curious “uniforms” of the LAPD. Looking much like a well-dressed test pilot, Coe was one of the early members of the “speed squad,” a motorcycle detail responsible for enforcement of speed laws in the City. Their “uniforms” consisted of driving caps, suits of tweed, neckties and large leather gloves. Not much safety equipment for a group that, according to the 1911 yearbook, “prevented the spread of the speed mania among reckless rich men’s sons with high powered automobiles.” This was hazardous duty for men seemingly fresh from the haberdashery. Coe was among the handful of officers assigned to ride a motorcycle. The Department’s inventory numbered only eight, and a portion of the early motors were set aside for use by the Captains’ plainclothesmen for “hurried answers to emergency calls.” While it might not have been a call, Coe was hurrying along to apprehend a speeder on November 19, 1910. In the company of his partner, Officer Wallace, Coe was intent on slowing vehicles speeding along Pico Boulevard early in the morning. While in pursuit of one violator, Coe’s motorcycle went down. At a speed of somewhere between forty and sixty miles per hour, Coe collided with a pole, crushing his skull. So severe were his injuries that the following day’s headline in the Los Angeles Times read, “Death Hovers over Officer.” The subtext was even more descriptive, “Is fatally injured while pursuing auto….skids with locked wheels to escape collision….thrown headlong into pole….skull fractured.” No one told the story better than his surgeon, Dr. C.W. Cook, who estimated Coe’s chances of survival at one in one-thousand. Coe was hospitalized for months. In defiance of all odds, Coe recovered and when his injuries proved debilitating Frank Coe was retired on a disability pension during the summer of 1912. Coe hung on for another nine years, until February 11, 1921, when his surgeon’s prognostication ultimately proved true. Dr. Cook, whose surgical skills undoubtedly prolonged the life of Officer Frank Coe, attended to Coe at his death, listing the cause of death as a cerebral hemorrhage due to a motorcycle accident in 1910 while on the speed squad. In this, the centennial commemoration of the first recorded loss, LAPM will be sharing stories of the solemn past. Frank Coe’s is just one of them. His death is not recognized on a monument, nor on the roles of those lost in the line of duty, so we share his story in recognition of his service to the City and his fellow officers. Frank Coe rests in peace alongside more than two hundred others who perished in this century of sacrifice. 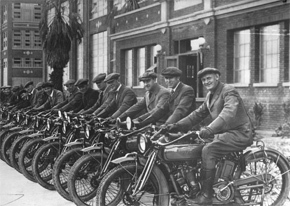 1913 Motor Officers in “uniform”. accumulated a storied history all its own. While all of this is going on, the historical society moves ahead with a number of projects at the museum. Construction is progressing in the Commissioners’ gallery. We look forward to opening our third floor with exhibits about Chiefs and Commissioners in the next few months. Simultaneously, restoration of our 1956 B wagon will commence. This, too, should be done in the coming months. As we wrap up our third floor galleries, we will move ahead with the construction of the SLA exhibit. In terms of special events, we will be hosting the 14th annual Jack Webb awards on Saturday September 8th at the Sheraton Universal. This is always a great evening for the historical society. Currently we are exploring an opportunity to participate in the Museums of the Arroyo day. Scheduled for May 20th, this is a date where a number of museums around the Arroyo Seco drop their admission fees and open their doors to visitors shuttled about by City Council sponsored buses. To learn more about this event, visit museumsofthearroyo.com. This new year that is now upon us is full of opportunity and promise. But there is still room for more. We have a number of volunteer opportunities available. We have plenty of projects that need tackling, so if you are interested in spending some time with us, please contact the historical society. And, if you are willing to work full-time, we still have an employment opportunity for someone who has a great interest in supporting the historical society and the department. Again, please contact us if you are interested.